The Kalamazoo Nordic Skiers wrapped up a record breaking season the morning of April 1, 2014 by loading up the snowmobile and groomers to store them for the summer. Dave DeBack, Zolton Cohen, Richard Neumann and Paul Wells were on hand for the packing up and loading of the equipment onto the trailer. In the past, we have used various storage facilities off-site. But this year the Kalamazoo Municipal Golf Association is allowing us to utilize a lean-to alongside one of their pole buildings right on the course. This generous offer by KMGA has made it easier and faster to stash the equipment, and it will also make it easier to access and unpack it when the snow flies again in the late fall. Thank you, KMGA! More than 100 inches of snow fell in the Kalamazoo area in the winter of 2013/2014, and right from the very first storm in November our two volunteer groomers, Richard Neumann and Dave DeBack, were able to groom excellent trails around the perimeter of the golf course as well as through the middle. They groomed a total of 38 times, put over 600 miles on the snowmobile, and burned through a lot of gas and oil in the process. Richard said the date of his last ski was March 23rd - unprecedentedly late in the season. For the first time in years we had sufficient snow to deploy a great auxiliary feature of our snow groomer, the Sno-Razor™. The Razor allowed the groomers to slice off the top layer of hardened and icy snow and then incorporate that reconstituted material back onto the trail. It made for a much flatter and less rutted surface, and superior skiing conditions. Each grooming session takes between 3-4 hours. So if you enjoyed the ski trails at Milham this year, please let our dedicated groomers know how much you appreciate their work; they put in a lot of time so everyone can enjoy the venue. Things were good in terms of donations this year as well; 35 people contributed to the cause. Our expenses for gas, oil and repairs came to $352.00, and we are left with adequate funds in the club checking account to get off the ground next year. All the grooming miles take a toll on our equipment. In response we are looking to upgrade and repair some items in the off season. For instance, Dave DeBack found some wider front skis (used) for the snowmobile that will prevent it from getting stuck so often in softer snow. He is also looking to straighten out the Sno Razor™ and the hitch, both of which became distorted this year. The Kalamazoo Nordic Skiers held a productive meeting last month - something we would like to continue on a regular basis. A number of issues were addressed, including finding a way to communicate trail conditions in a timely manner. We consulted with our friend, Kathleen Kroll, who helped us set up a Facebook page: www.facebook.com/kalamazoonordicskiers. Next year, whenever the trail is groomed, one of the groomers will send a notice around via Facebook. Skiers can also use it as a way to meet up with other people to ski together. We also discussed the possibility of offering some cross country ski instruction at some point. If and when that occurs, we'll post notices on our website, www.kalamazoonordicskiers.com and also on the Facebook page. Finally, did you know the Milham Park Golf course has a bar? We didn't either. But we are investigating to see whether it would be open during the winter for après-ski refreshment. Thank you to all who helped make this season a resounding success: First and foremost our groomers, Richard Neumann and Dave DeBack. The Kalamazoo Municipal Golf Association and its director, Dean Marks, Kalamazoo Parks and Recreation Director Sean Fletcher, and the helpful maintenance staff at Milham Golf Course also deserve kudos. And to all of those who thought our efforts worthwhile enough to support it with your donations, thank you. It was a stellar ski year. Let's hope for more of the same in 2014/2015! Last winter, we had to wait until well into January before there was enough snow to start grooming. This year, we're six weeks ahead of the curve! Grooming at Milham Park Golf Club keeps local skiers, skate and classical, from having to travel several hours to find a groomed trail to ski. The 2.1 mile groomed trail around the perimeter of the golf course is open to anyone, anytime, and at no charge. People of all ages come out to the golf course to enjoy the scenery, watch hawks that hang out at the golf course, possibly see deer hiding around the course, and of course, enjoy the skiing. The Kalamazoo Parks and Recreation Department and the Kalamazoo Municipal Golf Association help make the use of the course possible. Great cooperation from the people that run the golf course make it possible, and allowing the Kalamazoo Nordic Skiers to store their grooming equipment on site during the winter makes it very easy to keep the trails maintained. 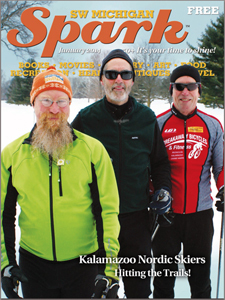 The city provides the space and land, but the Kalamazoo Nordic Skiers group puts in all the effort and equipment. Donations through this website (Paypal link to the left) help pay for gas and equipment upkeep, so it keeps it no-cost to the city, and free for the skiiers. Having this skiing venue located within our community is really a rare commodity - enjoy it while it lasts! The 2013/2014 Nordic ski season in Kalamazoo is off to a promising start - approximately five weeks earlier than it began last yet. Cold weather froze the ground prior to the first snow falling, and that helps prevent the snow from melting from below. Dave DeBack, Paul Wells, Dan Ferrara, Richard Neumann and Zolton Cohen moved the grooming equipment out of storage and over to the Milham Park Golf Course on December 12th, and Richard started grooming right away. Within a week there was enough snow to not only pack a skate ski trail, but also to set a shallow classic track. A couple of days of warm weather and rain did some damage to the trail, but skiers wisely kept off the groomed track, which kept it largely rut-free. Then it froze when the temperature dipped, and now new snow has fallen on top and has been groomed into a great skate ski course. More snow will have to fall before classic track can be set. But classic skiers can, of course, use either the edges of the skate ski trail or can break trail anywhere on the course. The golf course management requests that skiers stay off the greens and tee boxes. Please come and use this groomed cross country ski venue! It has been created for your enjoyment; there is no charge, and you can ski at any time of the day or night. If you feel like contributing to the ongoing trail-grooming expenses of the Kalamazoo Nordic Skiers, an all-volunteer organization, there is a means to do so elsewhere on this website. Special thanks go to our trail groomers, Richard Neumann, Dave DeBack and Paul Wells for all their efforts in making this venue a reality. The 2012/2013 Kalamazoo Nordic Skiers' season officially came to an end on March 21, 2013, as Paul Wells, Richard Neumann, Dave DeBack, Dan Ferrara and Zolton Cohen moved the snow grooming equipment into storage for the summer. It was a tough year for cross country skiers in this area, as there wasn't sufficient snow to start grooming the course at Milham Park Golf Course until after the middle of January. After that, chief groomer Richard Neumann said he only had the opportunity to groom ten times, putting 150 miles on the snowmobile. Despite the dismal snow accumulation, donations this season totaled $246.82. Thank you to all who donated! Your contributions help keep gas and oil in the snowmobile and also pay for any needed repairs. Expenses this season totaled $193.07. $108.60 went to gas and oil, the rest was for storage of the equipment ($50) and web hosting. Currently, there is $492.28 in the KNS savings account and $335.00 in checking, for a total of $827.28. That gives us enough operating capital to get a good start on next year's endeavor - whenever the snow depth reaches six inches.. Thank you to all who helped out this year with donations and moving the equipment to and fro, as well as to Milham Park Golf Course, the venue for the operation. Thanks as well go to Jeff Newman at Newman IT, for hosting the KNS website and manning the organization's information technology needs. Finally, special recognition goes to Richard Neumann, who did all the grooming this year, spending many, many hours on the noisy, smelly snowmobile to bring top-quality skate ski and inline cross country snow grooming to the Kalamazoo area. If you get a chance to speak to Richard between now and the start of the next ski season, let him know how much you appreciate his efforts! There is a reason one wag suggested we change the name of the Kalamazoo Nordic Skiers to the Kalamazoo Optimists Club. We kept wishing for snow this year and it only appeared sporadically. And then it melted quickly. So, there wasn't much in the way of cross country skiing at the Milham Park Golf course this winter. But when enough snow fell that we could groom, head groomer Richard Neumann got right on it, and conditions were as good as they could be. You had to be quick to enjoy it though, as the good snow never lasted very long. Richard said he groomed a total of 11 times this winter, and put 217 miles on the snowmobile. We spent $105.51 on gas and storage for the equipment for the summer, and took in $415.37, leaving us with a total in the treasury of $836.91 to get us started next year. Thank you to all the people who donated to keep this project going, and to those of you who came out and enjoyed what skiing there was to be had. Thank you, too, to the managers of the Milham Park Golf Course who have really extended themselves to make us feel welcome. If you golf at Milham in the summer, let the employees know that you're also a skier, and that you appreciate the fact that there is cross country ski venue available out there in the winter. And, finally, thanks go to Richard Neumann, who has devoted so many hours breathing the fumes of a smelly snowmobile so we can all ski. Richard works at Breakaway Bicycles. So if you do any business there, be sure to look him up and thank him personally. He, more than anyone, is the person who is responsible for keeping this project going. The only thing we can do is hope for better snow conditions next winter. See you then. Today, January 3, 2012, Richard Neumann, Dan Ferrara, Paul Wells, Dave DeBack and Zolton Cohen moved the Kalamazoo Nordic Skiers snowmobile and grooming equipment from storage to the Milham Park Golf Course. Although only 4-6 inches of snow is on the ground at the golf course, Richard made an initial pass with the roller/groomer in order to crush air out of the snow where the ski trail will run. It remains to be seen today if the other equipment can be used to set the skate ski lane; it is certain, however, that there is insufficient snow at present to set a classic ski track. On a scouting visit to the golf course recently, Richard said he noticed that, due to some landscaping changes, the ski trail route will need to be changed in several areas. This, however, should not materially affect the skiing or the enjoyment of those who use the venue. Thanks go to Dan Ferrara for performing not only yearend maintenance on the snowmobile, but also for changing its drive belt. It started on the first pull this morning, in 24 degree weather. Additional thanks go to Richard for organizing and doing the bulk of the grooming work over the past several years. It is a time-consuming process, and he has labored in order that others might benefit.. Although the snow took its sweet time arriving in Kalamazoo this past cross country ski season, once it got here it stayed and stayed. We couldn't even begin grooming at Milham Park Golf Course until January 8, 2011; a full month later than last year's startup date. But the season lasted, with very few warm-ups along the way, until early March. Much of that longevity was due to an unusual string of cold, sub-32-degree days. But it also had to do with the KNS corps of dedicated volunteer snow groomers, who learn more with each passing year about how to get the most out of the snow and the grooming equipment. Please go out of your way to thank Richard Neumann, Dave DeBack, Paul Wells and Dan Ferrara for the stellar job they do to keep the trails open and groomed. It takes between two to four hours to groom the course - and these volunteers were at it nearly every day this winter. Despite the fact that the donation signs never even made an appearance on the golf course this winter, the Kalamazoo Nordic Skiers received some generous donations to keep gas and oil in the snowmobile and for repair expenses. Skiers donated primarily through the Newman IT Solutions-hosted KNS website, at www.kalamazoonordic.com. But the club also received checks and cash dropped off at Breakaway Bicycles and the clubhouse at Milham Park Golf Course. Thank you to all who donated! At season's end, the KNS treasury stands at $622.59 - just enough to avoid the $5 monthly service fee charge for accounts at the credit union that fall under $500. Winter has kicked in again ("Let it snow! "), and the grooming equipment has been moved into place. We've had yet another warm reception at the Milham Park Golf Course, so the the only major change from last year we're hoping for is more snow! Get out your equipment, wax those skis, do your snow dance, and join us for the fun. Check back often to see the local weather and the updated ski condition reports. See you out on the trail! Unseasonably mild weather in early March 2010 brought an abrupt end to the 2009/2010 cross country skiing season at Milham Park Golf Course. Up until that sudden thaw the Kalamazoo area had reasonably good snow for most of the winter, and volunteer snow groomers from the Kalamazoo Nordic Skiers were able to keep a skate ski lane groomed on the course for most of the season. Classic ski track requires deeper snow to set, so their appearance was a matter of hit or miss - entirely dependent on the depth of the snow cover. Expenses for the season totaled $614.29. $50 went for storage of the snowmobile and groomers. $200 each was paid to Zolton Cohen and Paul Wells as partial repayment for loans they made to the organization in 2009. Those loans helped purchase the Sno-Razor attachment for the snow groomer. There is $135.31 left in the treasury to get the 2010/2011 season started next winter. Richard Neumann was again the primary volunteer groomer for the ski venue, and he deserves thanks for the many hours he put in behind the wheel of the sled. In good weather and bad, Richard showed up to groom the course, and many benefited from his efforts. Paul Wells, Dave DeBack and Dan Ferrara also took turns grooming. Thanks also go to the Kalamazoo City Parks and Recreation Department for allowing KNS to the groom the course, as well as the staff of Milham Park Golf Course, whose cooperation insured a successful ski season. Thank you to those who contributed $586.51 this season to the Kalamazoo Nordic Skiers. Your donations helped pay expenses this year and ensure there will be a 2010/2011 cross country ski venue once again in Kalamazoo. See you when the snow flies! The Kalamazoo Nordic Skiers are pleased to report that the first tracks have been set and skate ski grooming has taken place at Milham Park Golf Course. Dave DeBack and Paul Wells did four passes this morning with various pieces of equipment. Wells said it is not a "great" job yet, but it kicks off the season. And as he, DeBack, and others groom the course in the days ahead the trail will improve. Our thanks go to Richard Neumann, Dan Ferrara, Paul Wells, Mike Teal, and Dave DeBack, who devote many hours over the course of the ski season to groom the ski track at Milham Park Golf Course. Without their hard work, dedication - and yes, suffering in the cold wind while piloting the snowmobile for 2-3 hours at a stretch - there would be no groomed cross country ski venue in Kalamazoo. The 2006/2007 Nordic ski season arrived with everything, finally, in place for the Kalamazoo Nordic Ski group. Several volunteers retrieved the snowmobile from the pole barn where it had been stored over the summer. The new groomer, purchased in the fall, was assembled, greased, and ready to go. Keys were acquired and duplicated for access to the gate and a building on the Milham Park Golf Course site where the equipment was being stored. Bob Kennedy got the snowmobile ready to run. The Kalamazoo Municipal Golf Association was onboard with granting permission to groom the golf course. And in early December it even started to snow. Though the snow started early in the season, and was encouraging to see at first, it was light, fluffy lake effect stuff; and not enough fell for grooming purposes. December's snowfall melted as the temperature climbed into the 40's, and not until the third week in January did the Lake Michigan "snow machine" start back up again. As soon as there was six inches on the ground, Bob Kennedy and other volunteers hooked the snowmobile to the new groomer and made the first grooming runs around the golf course. After a few adjustments to the equipment, it became apparent that KNS had chosen well in purchasing the new groomer. It not only packs the snow evenly, it also leaves a uniform "corduroy" track in its wake - perfect for "skate" or "freestyle" skiing. And its design allows a relatively rapid grooming pace. After packing and grooming the skating lane, Kennedy hooked up the "inline" or "classic" tracking plate and pressed tracks into the snow on both sides of the skating trail. After the first week, Dan Ferrara joined Kennedy in sharing the grooming duties, and the venue was freshened and regroomed nearly every day thereafter until the weather warmed up again. Despite frigid temperatures and windy conditions in late January and early February, many people came out to enjoy cross country skiing on the groomed course. A troop of Girl Scouts even fulfilled requirements for their winter outing badges by negotiating a loop one Saturday morning. Despite the very late start and bitter cold, what there was of the 2006/2007 ski season was a success. KNS learned a lot about grooming and the new equipment, and will be prepared to put the knowledge and experience gained to use next winter when the snow again begins to fall. Total grooming expenses for the year were $39.68. Storage for the equipment over the summer is $50.00. At present the KNS treasury contains $167.85. Please park in the lower parking lot on Lover's Lane when you use Milham Park Golf Course for skiing or sledding - not the upper parking lot by the Golf Course Clubhouse. Employees of the golf course must lock the gate at certain times of the day. Your car could be trapped inside the upper lot if you happen to be out on the course when the gate must be secured. A request of dog owners. The groomed trail at Milham Park Golf Course is intended and groomed for the use of cross country skiers. Please respect the efforts of those who have organized and funded this venue by not walking or allowing dogs to run on the packed track. Dogs contribute to conditions that deteriorate the trail surface, and they can cause injury to skiers. Milham Park Golf Course groomed for classic style as well. With the last grooming, the skate track is now about 8 feet wide, and there are classic tracks set off both sides of the skate path. As of Sunday, the trail was still in good condition, although apparently well enjoyed over the weekend. Milham Park Golf Course has been groomed for cross country skiing. This afternoon we met at the Milham Park Golf Course to finally put all the pieces of our cross country ski venue project together. Despite a few snafus - which included not remembering to bring the key to the snowmobile - we got everything up and running, and we tracked a nice trail around the perimeter of the course. So, we're finally grooming. My advice is to take advantage of it whenever you can; winter has shown its capricious nature this year, no? As to the details, the new snow groomer we purchased this fall worked very well on the newly fallen snow. After we got it adjusted correctly, it crunched all the air out of the snow nicely and laid down a smooth, "corduroy" track surface. I skate skied around the loop five times this afternoon, and in the places where the snow was originally the deepest, the grooming was equivalent to what I've experienced at places like Love Creek and Pigeon Creek. So, very good indeed. Under some of the trees there are walnuts and branches that poke out through the snow, but I think we can adjust where the route goes next time we groom to avoid the worst of that. And on my first loop I did a bit of trail maintenance and picked up what I could find of the debris and tossed it to the side. That's a good idea for anyone else who uses the trail, by the way. It helps preserve the snow for as long as possible. Inline skiers might be disappointed to not find a track set for that type of skiing. We don't yet have the tracking plate at the golf course yet, but hope to get it this week. And we really need to wait for more snow before we can use it. With the air crushed out of the snow, the skating track compressed down to about an inch to two inches; trying to set classic track in that amount of snow would mean that we'd tear up the grass on the golf course. But the skating track is fun to inline on too. If you do classic skiing, it's best to stay over to one side of the track or the other. That way your tracks won't get wiped out and skied over by the fanatical skate skiers out there.